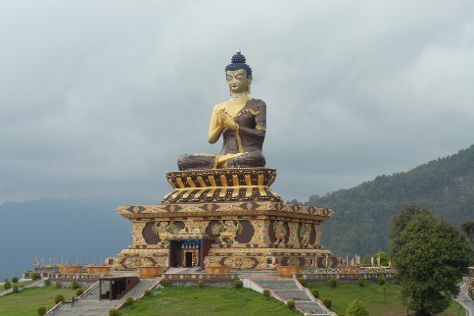 On the 5th (Wed), admire the landmark architecture of Doling Gompa, hike along Maenam Hill, then contemplate in the serene atmosphere at Tumlong Monastery, and finally walk around Buddha Park. To find traveler tips, ratings, photos, and other tourist information, go to the Ravangla tour itinerary app . Gaya to Ravangla is an approximately 17-hour car ride. Expect little chillier weather when traveling from Gaya in June: highs in Ravangla hover around 38°C, while lows dip to 29°C. Wrap up your sightseeing on the 5th (Wed) to allow time to drive to Gangtok. You'll visit kid-friendly attractions like Tsongmo Lake and Flower Exhibition Centre. There's still lots to do: wander the streets of MG Marg, don't miss a visit to Nathula Pass, take some stellar pictures from Ganesh Tok View Point, and take in the spiritual surroundings of Ranka Monastery. To find traveler tips, photos, other places to visit, and tourist information, use the Gangtok online holiday planner . You can drive from Ravangla to Gangtok in 1.5 hours. Wrap up your sightseeing by early afternoon on the 11th (Tue) to allow time for travel back home.